Who’s to Blame for the Cowboys’ Failures? I’m going to describe a team and let you try to guess which it is. Hopefully, that last one gave it away (if the title of this post didn’t already). How ‘bout them Cowboys?! That’s right, the Dallas Cowboys, the NFL’s highest valued franchise has been mediocre at best for over two decades. Dem Boyz just can’t seem to live up to the standard set by Roger Staubach, Tony Dorsett, and the famous Triplets. Are they capable of returning to the top of the NFL mountain? Will they ever win another Super Bowl or is the winning culture in Dallas gone? I don’t wanna scare away any intrigued Cowboys fans by saying “yes, it is gone,” so I won’t. However, I will say something that will make a fan angry enough to read what I have to say. “That culture is LONG gone!” Now don’t worry citizens of Dallas, I didn’t write this just to pick on you. I have an answer for your problems, and maybe even a solution. Now what exactly happened to the Cowboys? There are two people that need to be terminated if the Cowboys are ever going to return to the promised land. First, Jason Calvin Garrett. Now, I know Garrett hasn’t been in Dallas very long. Though ever since he arrived, he has not stopped crushing this team’s chances. “What? Garrett’s won Coach of the Year! He’s got a .558 winning percentage!” Please! Don’t let this man fool you. He is supposedly an offensive minded coach, but for some reason he doesn’t call the offensive plays. He has taken some really good looking teams and turned them into 8-8ers. Seriously, the guy has had some of the most talented players in the league at his disposal ever since he took over as Head Coach in 2010, and what does he have to show for it? 3 winning seasons, and 2 losses to the Packers in the second round of the playoffs. To Garrett’s credit, he has a good system for his star players to succeed in, but this is the NFL! To be a winning coach you have to have a system that everyone on your roster can succeed in and this is not something Garrett is capable of. Anytime Romo went down, he couldn’t adjust. When Sean Lee takes his annual vacation during the season, Garrett’s defense gets shredded. When he lost Zeke for 6 games last year, his offense fell apart. A head coach in the NFL should be expected to adapt to changes on their roster such as injuries and suspensions. 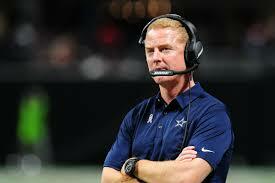 Garrett has failed to adapt to such hardships in his term as Head Coach. Additionally, Jason Garrett is as inconsistent as it gets when it comes to the culture that he tries to create for his team. I always hear Garrett in press conferences talking about having the “right kind of guys.” He wants his team to be a bunch of good guys who don’t get in trouble, which is great; I wish all NFL coaches would take the personality and morality of their players into consideration. The problem is Coach Garrett is a huge hypocrite! He’s played and started Greg Hardy after all of his off the field problems. He even continued to play Hardy after his obvious disrespect of a Cowboys coach during the season in 2015. Garrett has also played guys like Dez Bryant who was involved in a domestic violence incident, Randy Gregory who has been suspended countless times for drug use, and Ezekiel Elliot whose incidents need no clarification. Where are these “right kind of guys”? Now don’t get me wrong, I know there are players involved in scandals all over the NFL. How do other coaches handle these types of players? Bill Belichick didn’t play Wes Welker until the second half of an AFC Divisional playoff round against the Jets to punish him for being disrespectful towards Jets Head Coach, Rex Ryan. Belichick also didn’t let his top pass rusher, Chandler Jones, play in a playoff game after Jones found himself at a local police department prior to the game. Garrett does not punish his players for off the field issues; He just loves to pretend like he’s created a locker room full of heavenly boy scouts, when he clearly hasn’t! That type of inconsistency can’t resonate with players well, and it certainly doesn’t translate to winning games. If the Cowboys want to bring their franchise back to glory in the NFL, Jason Garrett has got to go. This begs the question, “Why hasn’t Garrett been fired?” Well, that’s because the guy who signs Garrett’s checks wants a puppet. That man, Jerry Jones, wants a guy like Garrett who won’t hesitate to fall on his sword so Jones doesn’t have to admit he was wrong. It’s this lack of responsibility from the owner that has truly crippled the Cowboys franchise. That’s right, Jason Garrett is a huge problem. Though he wouldn’t be here if it weren’t for the bigger problem, Jerry Jones. That however, is a discussion for another day.